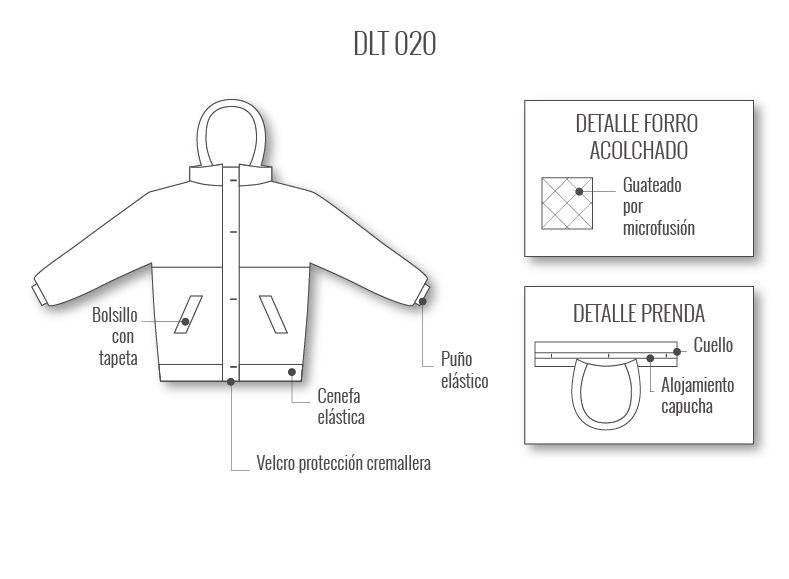 This garment complies with the requirement of REGULATION (EU) 2016/425. EN-ISO 13688:2013, EN 343:2003+A1:2007/AC:2009 and UNE-EN14058:2004 for this PPE. This PPE corresponds to a jacket with quilted lining in a functional design that fastens with a zipper protected with a storm flap that fastens with 5 snaps. The high collar houses a roll-away hood. It includes three pockets: two on the front with storm flaps and a third pocket in the interior at chest height with velcro flap closure. The cuffs and bottom of the jacket end in elasticated knit.